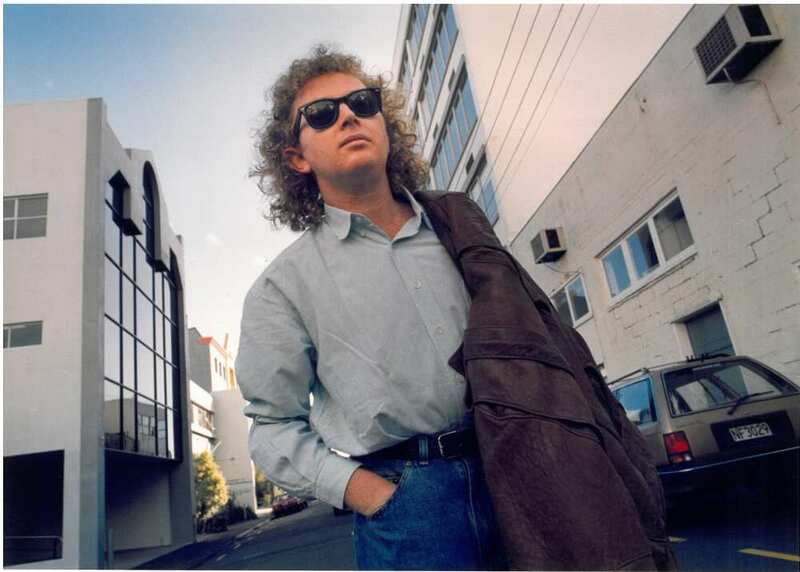 Dave Dobbyn. The Auckland Sun, 1980s. Auckland Libraries Heritage Collections, 1329-11. 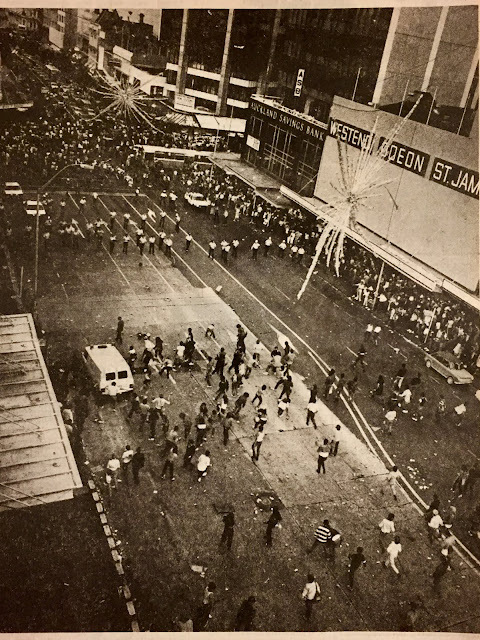 Around 10,000 people and 20 police were present in the Square at the time; then around 3000 young people swarmed down Queen Street merging with late night shoppers and traffic. The riot lasted for two hours and by the end of the evening 400 police were involved. Sixty three shop windows were smashed, cars overturned and set alight. Acting district police commander Graham Perry said “at one stage a police van containing 18 prisoners was surrounded by a mob brandishing firebombs and handkerchiefs dipped in petrol.” The officer in charge released the prisoners rather than risk their being burnt. He was attacked by the mob, and taken away on a stretcher. Forty two police were injured by flying glass, bottles and rocks. Photograph of the crowd taken through a shattered window. Auckland Star, 8 December 1984. Earlier, a power cut had shut down DD Smash about one minute after they began playing. The power cut lasted 20 minutes and during this time the crowd became restless. When the band started up again, Dobbyn said he noticed a disturbance by the post office but they continued playing, completing two more songs before police shut down the concert. A witness at Dobbyn’s trial said Dobbyn had tried to generate a jovial mood amongst the crowd and there was no need for the riot police to be present. Mark Scott discussed police brutality during the riot in a NZ Listener article. He saw a policeman hitting girls with a baton. “Unbelievably, he [threw] them backwards off the wall onto the concrete four metres below,” Mr Scott wrote. When he approached the policeman, he got batoned on the elbow and in the back as he ran away. One of the most iconic images of the riot shows Māori Warden Hine Grindlay marching down Queen Street with members of a peace group. They formed a human chain between police and rioters, ignoring their own personal safety, and tried to persuade youths to leave. Mrs Grindlay later received a Queens Service Medal for bravery. Hine Grindlay and others forming a human chain. New Zealand Herald. 10 December 1984. Ramming plate glass windows with a light cover. Auckland Star, 8 December 1984. The government appointed a three-member Committee to investigate the riot. This was chaired by High Court judge Peter Mahon. They met within a week of the event and reported back to the government ten days later. They considered key causes were the ease of access to alcohol for young concert goers, and poor planning for the scale of the event by police and the Auckland City Council. Another key cause was police shutting down the concert once trouble began. “In our view 95% of the crowd … would have stayed exactly where they were and concentrated their attention on the ‘DD Smash’ band,” they reported. Some blamed inner-city hotels for selling alcohol to teenagers during the afternoon. This prompted the Hotel Association of NZ to run a newspaper advertisement stating none of their members knowingly supplied alcohol to under-age drinkers, and therefore did not contribute to the riot. Metro magazine asked nine Aucklander’s for views on the riot. Julie Roberts was a 16 year old student at that time. She had been enjoying listening to DD Smash when suddenly she was shoved forward. She turned to see eight police in riot gear, batons extended, approaching the crowd. Audience members started throwing beer cans, bottles and rocks at the police. She witnessed many injuries including a girl with her head cut open by a flying bottle, and a child of about eight running past in a very distressed state. “He only has four fingers. Blood is everywhere… Little kids are crying because they’ve lost their parents or, like me, are just plain scared,” she wrote. Auckland Star, 8 December 1984. Many of the Metro respondents were keen to understand underlying causes for the riot, including then Mayor of Waitematā City, Tim Shadbolt. He compared the riot to numerous free rock shows he had attended in the 1960s “at which alcohol and drugs were consumed in large quantities, and there was almost inevitably a bunch of yahoos somewhere in the crowd who would throw cans and urinate in public.” But none of these events had erupted into a full scale riot. “Not once did I ever see a policeman draw a baton,” he wrote. He was struck by the historical precedent set in 1932 when a crowd of unemployed relief workers and Post and Telegraph Association members rioted down Queen Street, smashing windows and fences, and police used batons on the crowds. Similarly, he thought unemployment may have been a factor in the 1984 riot. 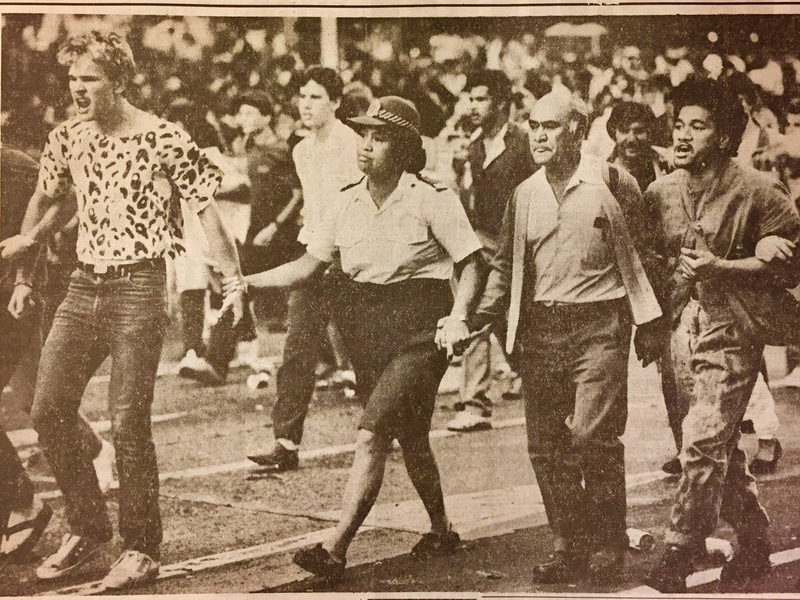 Race Relations Conciliator Hiwi Tauroa considered the 1981 Springbok Tour demonstrations had created a rift between police and youth. “Parties which are distrustful of each other will clash and riot gear is, purely and simply, a threat and a challenge,” he wrote in Metro. He felt unemployment, and an opportunity to challenge authority, were also contributing factors. 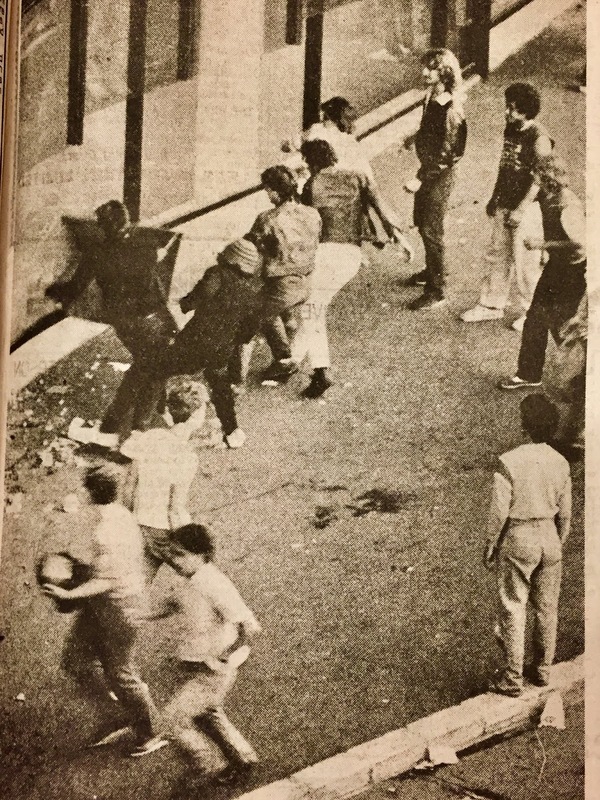 However, the Mahon Committee concluded that, “In our view, it is clear beyond doubt that this was a riot without racial or social motivation.” Metro columnist Bruce Hucker documented the riot’s arrest statistics which suggested these very issues may have played a part. Of the 120 people arrested; 42 were unemployed (35%), 12 were students, and 58 had low status jobs such as labourers, cleaners or process workers. Of the 120 people arrested; 55 were Caucasian, 44 Māori and 21 from Pacific Island backgrounds. Mr Hucker recommended a second, wider government enquiry be undertaken, similar to the 1981 Scarman report about rioting in the London suburb of Brixton. This report considered the deeper factors that may have fed into the event. A group of Auckland community workers, probation officers, university lecturers and civil liberties organisations also thought a second enquiry would be beneficial; but the government did not agree. South Auckland community worker Poumau Papali’i said the Mahon report was of little value if not put into a wider social context, and that its limited scope left most people comfortably stroking their pet prejudices. “Instead they just blame it on booze and leave all the difficult questions unanswered,” he said. Police procedures and underage drinking laws were subsequently rewritten after this event. This was the second riot in Queen Street. The first occurred over 50 years earlier in 1932. Police drew batons on unemployed relief workers and union members attending a meeting at the Town Hall to protest at starvation rations. Over 15,000 people attended the meeting but the doors closed on 2000 and many of those left outside smashed their way down Queen Street. 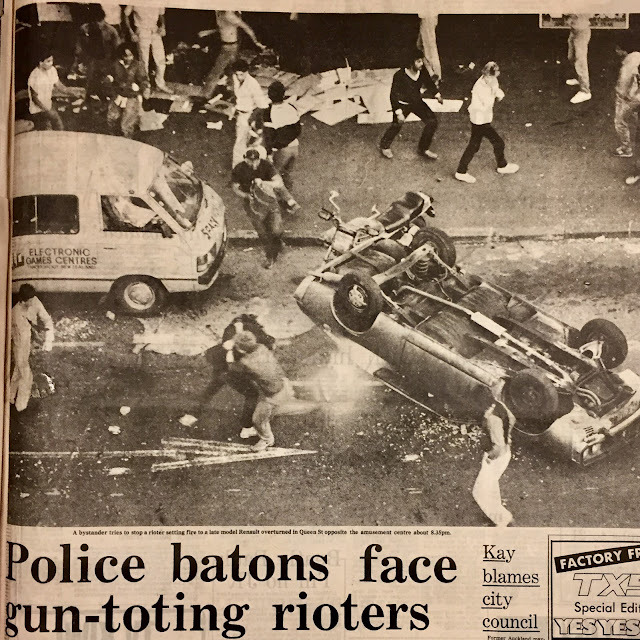 The following night, a similar riot erupted in Karangahape Road. We will cover the 1932 riot in a subsequent blog. NZ Listener, 19 January 1985. NZ Herald, 8 and 10 December 1984. NZ Herald, 5 December 2009. Report of the Committee of Inquiry into the Riot at Auckland on 7 December 1984.